Objective: The current work was carried out between 2013-2014 during the fishing periods to evaluate certain fish aggloremations within 3 miles of the coastal zone. Therefore, some basic characteristics of fish populations along the Inceburun coast of the Sinop province of the Black Sea were examined. Materials and Methods: Data was collected from 5 trawl operations in the Sinop-Inceburun Region of the Black Sea at depths of 20 to 39 meters at 5 different locations. Biometric measurements of each species was made. A literature search was performed to gather information about the status of threatened fish species found in the region. The length-weight parameters of 4 commercial fish species were estimated. Results: During the fishing season between 1st September 2013 and 15th April 2014 different fish species were captured depending on the season and climate. In these surveys, 16 teleost species from 15 families, 2 elasmobranch species from 2 families and 2 species of invertebrates were recorded from 5 different stations. In these surveys random samples of red mullet, bluefish, horse mackerel, turbot etc. were collected from 5 different stations. The total mean CPUA was estimated at 425.30 kg/km2. Conclusion: The Black Sea areas including those around the Sinop coast have an important effect on the entire production of sea fish of the Turkish fishery. In addition, Sinop fisheries generate significant fishery production supporting logistics and employment. In the Sinop peninsula, there is an increasing trend towards the production of commercial species of the Black Sea. Bat L, Sezgin M, Satılmış HH, Şahin F, Üstün F, Birinci-Özdemir Z, Gökkurt-Baki O. Biological diversity of the Turkish Black Sea coast. Turkish Journal of Fisheries and Aquatic Sciences 2011; 11: 683-692. Zaitsev Yu, Mamaev V. Marine Biological Diversity in the Black Sea: A Study of Change and Decline. New York (USA): United Nations Publications (USA); 1997, 208 pp. Bat L, Özkan E.Y. Heavy metal levels in sediment of the Turkish Black Sea coast. In: Bikarska I, Raykov V, Nikolov N, editors. Progressive Engineering Practices in Marine Resource Management. USA: IGI Global book series Advances in Environmental Engineering and Green Technologies (AEEGT); 2015. pp. 399-419. ISSN: 2326-9162; eISSN: 2326-9170. Bat L, Özkan EY, Öztekin HC. The contamination status of trace metals in Sinop coast of the Black Sea, Turkey. Caspian Journal of Environmental Sciences (CJES) 2015; 13 (1): 1-10. Bat L, Arıcı E. Health risk assessment of heavy metals in Sarda sarda Bloch, 1793 for people through consumptionfrom the Turkish Black Sea coasts. International Journal of Zoology Research 2016; 1(1): 01-07. Bat L, Öztekin HC. Heavy metals in Mytilus galloprovincialis, Rapana venosa and Eriphia verrucosa from the Black Sea coasts of Turkey as bioindicators of pollution. Walailak Journal of Science and Technology 2016; 13 (9): 715-728. Bat L, Arıcı E, Sezgin M, Şahin F. Heavy metal levels in commercial fishes caught in the southern Black Sea coast. International Journal of Environment and Geoinformatics 2017; 4 (2): 94-102. Bat L, Arıcı E, Ürkmez D. Heavy metal levels in the Black Sea sprat (Sprattus sprattus). International Journal of Research in Agriculture and Forestry 2017; 4 (6): 1-8. Commission Regulation (EC). No 1275/2013 of 6 December 2013 amending Annex I to Directive 2002/32/EC of the European Parliament and of the Council as regards maximum levels for arsenic, cadmium, lead, nitrites, volatile mustard oil and harmful botanical impurities. Official Journal of the European Union 2013; L 328: 86-92. Commission Regulation (EU). No 488/2014 of 12 May 2014 amending Regulation (EC) No 1881/2006 as regards maximum levels of cadmium in foodstuffs. Official Journal of the European Union 2014; L 138: 75-79. Commission Regulation (EC). 2015. Official Journal of the European Union. amending Regulation (EC) No 1881/2006 as regards maximum levels of lead in certain foodstuffs. Official Journal of the European Union 2015; 161: 9-13. TFC. Notifications about determination of the maximum levels for certain contaminants in foodstuffs of Turkish Food Codex. Official Gazette of Republic of Turkey 2002; Notification No: 2002/63, Issue: 24885. (inTurkish). Whitehead P.J.P., Bauchot M.L., Hureau J.C., Nielsen, J., Tortonese, E. Fishes of the Northeastern Atlantic and the Mediterranean. Paris: UNESCO; 1984, 1473 pp. Fischer W., Bauchot M.L., Schneider M. Fiches FAO d’identification des espèces pour les besoins de la pêche. Méditerranée et mer Noire (Zone de pêche 37). Rome: FAO and EEC;1987, p. 761-1530. Bat L, Erdem Y, Ustaoglu-Tırıl S, Yardim Ö. Fish Systematic. Ankara: Nobel Yayin Dagitim Ltd. Sti; 2011, 272 pp. ISBN: 978-605-133-116-4 (in Turkish). Zarrad R., Missaoui H. Morphometric relationships of fattening bluefin tuna (Thunnus thynnus) caught in the central mediterranean in 2013 and 2014. Collect. Vol. Sci. Pap. ICCAT 2017; 73(6): 2188-2194. Andrade H.A, Camos R .O. Allometry coefficient variations of the length–weight relationship skipjack tuna (Katsuwonus pelamis) caught in the southwest South Atlantic. Fish. Res. 2002; 55: 307–312. Pauly D. Fishbyte Section Editorial. ICLARM Quart, Naga. 1993 16, 26p. Anderson R, Gutreuter S. Length, weight and associated structural indices. In: Nielsen L, Johnson D. editors. Fisheries Techniques. Bethesda: American Fisheries Society;1983. pp. 283–300. Petrakis G, Stergiou K.I. Weight-length relationship for 33 fish species in Greek waters. Fisheries Res 1995; 21: 465-469. Bat L, Erdem Y, Ustaoğlu S, Yardım Ö, Satılmış H.H. A Study on the Fishes of the Central Black Sea Coast of Turkey. J. Black Sea/ Mediterranean Environment 2005; 11 (3): 287-302. Gönener S, Bilgin S. The Distribution and Biomass of Catchable Fish Caught by Commercial Bottom Trawl in the Black Sea (Sinop-İnceburun Region). Journal of FisheriesSciences.com 2010; 4 (3); 195-208. doi:10.3153/jfscom.2010021 (in Turkish). Gönener S, Özdemir S. The Biomass and Density Changes of Catchable Fish Caught by Bottom Trawl in the Black Sea (Sinop-İnceburun Region). Journal of FisheriesSciences.com 2013; 7(2): 125-140. doi: 10.3153/jfscom.2013014 (in Turkish). Anonymous. Fisherman Boats and Fishery Statistics in 2010. Ministry of Agriculture, Sinop Provincial Directorate, Sinop. 2010. (in Turkish). Kaykaç M.H, Tosunoglu Z, Tokaç A. Trawl fisheries. In: Tokaç A, Gücü A.C, Öztürk B, editors. The state of the Turkish fisheries. Istanbul: Turkish Marine Research Foundation; 2012. p. 316-328. ISNAD Bat, Levent , Şahin, Fatih , Sezgin, Murat , Gönener, Sedat , Erdem, Ercan , Ozsandikci, Ugur . "Fishery of Sinop Coasts in the Black Sea Surveys". 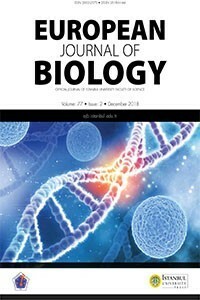 European Journal of Biology 77 / 1 (June 2018): 18-25.